Join us for a live-televised #BHeard Town Hall discussion on how we can tackle the 'defining issue of our time': economic inequality. Is America still the land of opportunity? If you work hard can you really get ahead? NYC’s rising cost of living, income stagnation, and student debt (among other factors) have converged to create a tale of two cities. A tale that has given birth to different sets of challenges for NYC’s low income, working class and middle income populations. 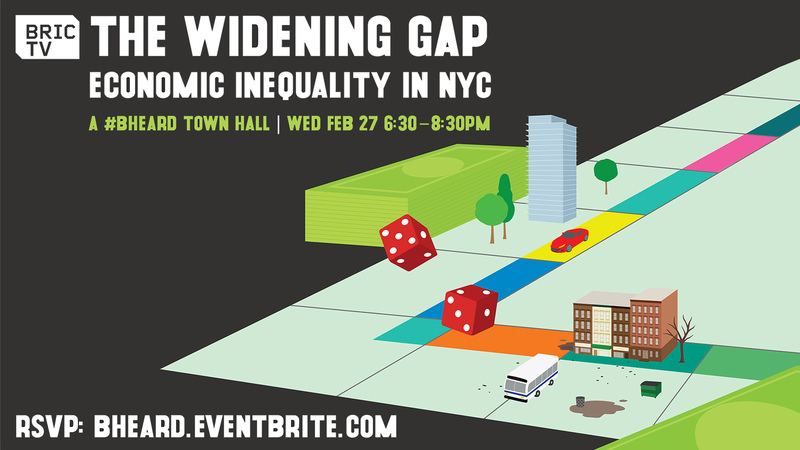 This #BHeard Town Hall we ask the question: What does economic inequality in NYC look like for you? The BRIC Ballroom is a wheelchair-accessible, flexible performance space that accommodates a wide variety of configurations and performance styles. Located on the first floor of BRIC House. All of the above buses stop within three blocks of BRIC.